Pleasant Surprises: 236,000 Jobs Added; Jobless Rate Dips To 7.7 Percent : The Two-Way February's jobs numbers were better than expected. The jobless rate is now the lowest it's been since President Obama took office. The rate's recent peak was 10 percent in October 2009. 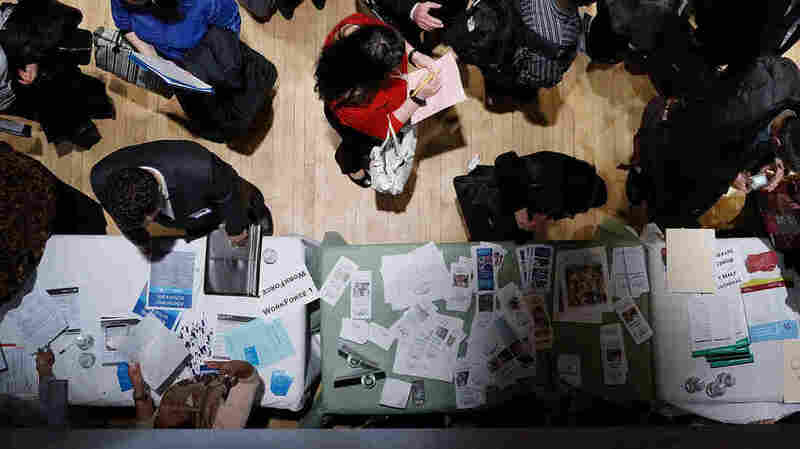 The scene at a job fair in Manhattan earlier this month. There were 236,000 jobs added to payrolls in February — many more than expected — and the jobless rate unexpectedly dropped by two-tenths of a point, to 7.7 percent, the Bureau of Labor Statistics reported Friday. The news came as a surprise to most economists. As we reported earlier, they had been expecting to hear that employers added about 160,000 jobs to payrolls and that the unemployment rate stayed near January's 7.9 percent. We'll be adding more details from the report and reactions to it, so hit your "refresh" button to be sure you're seeing our latest updates. "While more work remains to be done, today's employment report provides evidence that the recovery that began in mid-2009 is gaining traction," the president's top economic adviser, Alan Krueger, writes on the White House blog. He adds that "the economy has now added private sector jobs every month for three straight years, and a total of 6.35 million jobs have been added over that period." At 113.2 million, private sector employment in February was back to near where it was in October 2008 — but was still down more than 2 million jobs from its peak of 115.7 million in January 2008. "Positive news in today's jobs report but unemployment still far above what @WhiteHouse projected w/its 'stimulus' http://j.mp/Zlwj9f"
"Any job creation is positive news, but the fact is unemployment in America is still way above the levels the Obama White House projected when the trillion-dollar stimulus spending bill was enacted, and the federal government's ongoing spending binge has resulted in a debt that exceeds the size of our entire economy. ..."
The White House typically posts its comments on its blog. Update at 9:22 a.m. ET. Will Stocks Rise Further? "On Wall Street, investors cheered the latest jobs figures," MarketWatch writes. "Stock futures pointed to a higher opening, while the dollar also extended gains." Major indices were already trading in record-high territory. According to BLS, the number of "discouraged workers" went up in February, to 885,000 from 804,000 the month before. Those are people who have given up looking for jobs because they don't think any are available. There were also 7.99 million people working "part time for economic reasons," up slightly from 7.98 million in January. Update at 9:05 a.m. ET. Where Many Of The Jobs Were. -- "Professional and business services" firms employed 73,000 more people. -- Employment at health care providers and related industries grew by 39,000. -- "Leisure and hospitality" businesses added 24,000 jobs. -- Retailers expanded their payrolls by nearly 24,000 jobs. -- Manufacturing employment grew by 14,000. The shaving of government staffs continued in February, BLS says. There were 10,000 fewer workers on local, state and federal payrolls last month. But a 246,000-increase in payrolls at private employers produced the overall boost of 236,000. A month ago, BLS estimated there had been 157,000 jobs added to public and private payrolls in January. Now, it estimates there were 119,000 more jobs that month. But, BLS has now twice revised up its estimate of job growth in December. It began by saying there had been 155,000 jobs added that month. Later, it revised the figure to show growth of 196,000 jobs. Friday, it raised the December figure futher — to 219,000. At 7.7 percent, the jobless rate is the lowest it's been since December 2008's 7.3 percent. The month President Obama took office, January 2009, the rate stood at 7.8 percent. In the years since, it peaked at 10 percent in October 2009. It has now been just below 8 percent for six straight months.